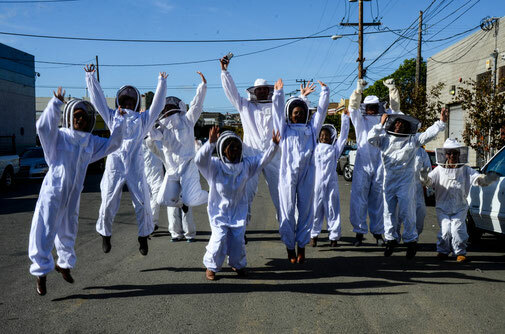 Take a Beekeeping Class with San Francisco Honey & Pollen Co. Today! With SF Honey & Pollen Co. you will experience the ultimate hands-on beekeeping class. We currently offer both Beginning Beekeeping Classes and Advanced Beekeeping Classes. Our owner, John McDonald teaches with a very hands-on, "in the hive" approach. Whether you take a beginner class and walk away with a new understanding and appreciation for bees, or come to us with beekeeping experience or as a return student and learn to spin honey in our advanced class, you're sure to have a great time! "I thought John was extremely knowledgeable. I was very impressed with the breadth and depth of his knowledge - he was great!" "John gave me a new perspective on life... Especially those amazing honey bees!" "Beekeeping 101 at it's best!" "The class was fun and very informative! Plus the honey is amazing." "Unique and fun experience. Highly recommend." Please click here to view our 2019 Calendar of Classes. *Classes will resume February 2019. We currently have a limited calendar of classes available, more dates will be added soon! Our Beginner Beekeeping Classes are open to the public, ages 10 & up (students 14 and under must be accompanied by an adult). Advance purchase/reservation is required. To purchase tickets or to learn more about our Beginner Beekeeping Class, Click Here. If you have any questions, please contact us. Our Advanced Beekeeping Classes are open to returning students and/or those with previous basic beekeeping knowledge. Advance purchase/reservation is required. To purchase tickets or to learn more about our Advanced Beekeeping Class, Click Here. If you have any questions, please contact us.